Aubais, a commune in the Gard department in southern France, is well known for its bull tradition. Camargue Bull Run or Bandido is somewhat strange and today considered cruel practice – Gardians on Camargue horses (an ancient breed of horse indigenous to the Camargue area in southern France) lead the bull that runs through the streets of Aubais. Claude Viallat, a French abstract artist, was born in Nîmes but grew up in this town, from which he carried off a strong fascination with bulls and tauromachy. Besides Claude’s artistic career, he dedicated a great amount of time and energy to create his famous and rich collection of objects related to bulls. It was precisely his collection that was taken as a starting point for the Musée des Cultures Taurines (Museum of Bull Tradition) in Nîmes, established in 1986. Claude Viallat attended the École des Beaux-Arts in Montpellier, and it was there where he made strong friendships with artists such as André-Pierre Arnal, Vincent Bioulès, Daniel Dezeuze, Toni Grand, François Rouan, and Henriette Pous, his future wife. From 1958 to 1961 to served army in Algeria and upon his return Claude was admitted to the École Nationale Supérieure des Beaux-Arts in Paris, where he met Joël Kermarrec, Pierre Buraglio, and Michel Parmentier. During his stay in Paris, Viallat discovered works of American artists like Kenneth Noland, Morris Louis, Sam Francis, and Mark Rothko. Their intriguing style led Claude towards abstraction – and in 1963, he was strongly determined to create a brand new formal language that will reassess classical painting conventions. A method he developed involved one shape attached on canvas without any stretchers. 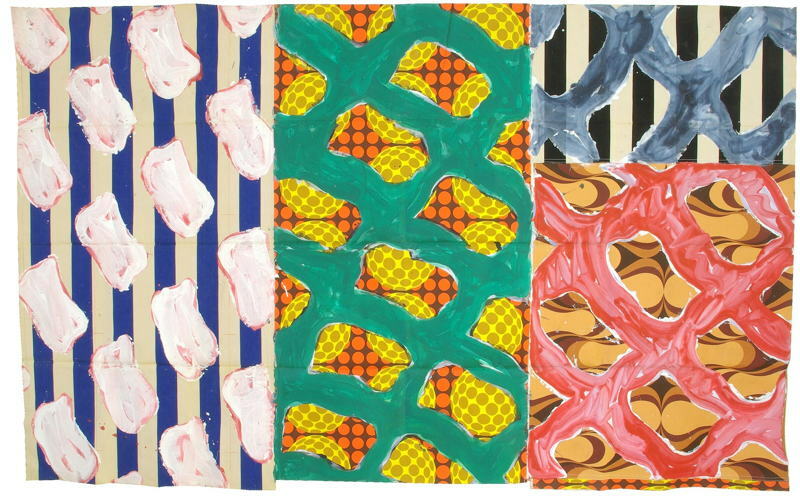 Claude Viallat’s first solo show was held at Nice’s Galerie A in 1966. In June of 1969, during an exhibition at the Havre Museum titled La Peinture en question (The painting in question), Vincent Bioulès, Louis Cane, Marc Devade, Daniel Dezeuze, Noël Dolla, Jean-Pierre Pincemin Patrick Saytour André Valensi, Bernard Pagès and Claude Viallat wrote the catalog where they claimed that the subject of the painting is the painting itself and that the paintings on display are related only to themselves – meaning that the personality of the artist, his biography or even art history has absolutely nothing to do with the essence of the idea that the artwork transmits to the viewer. This is how and when a movement called Supports/Surfaces was created. This group is characterized by an original approach that gives more importance to materials, creative gestures and the final work than the subject itself. A Supports/Surfaces group was a short-winded movement that brought together artists whose practice of painting questions its basic components. Challenging traditional pictorial means, these artists joined in a research of the theoretical reflection and political positioning within the journal Cahiers-painting. In time, disagreements grew between group members and the split happened in 1972. Very often a Supports/Surfaces is considered the last movement pioneering French modernity and which definitively closed the cycle. Claude gave up on his membership in the group on May 3 of 1971 when his disagreement with the political and theoretical orientations by Louis Cane and Marc Devade escalated. During his Supports/Surfaces period of time, Viallat used recycled materials in his works at the time: objects and stuff like tarpaulins, umbrellas, various fabrics, woven or knotted rope. Also, he developed a method where he would neutrally repeat the same pattern or a shape over and over again. A shape is applied to a variety of surfaces with a brush and a stencil, and a work is always left unsigned. The main focus is on the color itself: the combination of different colors in the composition and any optical effect it can produce. Claude’s experimentation with found objects evolved to a group of paintings he titled kitsch as he used materials such as glittered or lamé fabrics, tie-dye velvet and printed Pop art design. In 1972, Viallat took a trip to the States where he was quickly mesmerized by the work of Jackson Pollock and Native Indians. Upon his return, Claude moved to Marseille to teach at the École des Beaux-Arts of Luminy. In 1979, Claude Viallat got the position of a director of the École des Beaux-Arts in Nîmes. In 1982, The Centre National d’Art et de Culture Georges Pompidou organized his retrospective and in 1988, Claude represented France at Venice Biennale. From that moment, this artist became known for the use of sails in his artworks. More precisely, Claude only used two types of sails: Venetian and Catalan, expanding his range of materials and methods used in an artistic process. This year, 1988 was very fruitful and diverse for this author. Viallat inaugurated his stained-glass windows of the Gothic Choir in Nevers Cathedral, but also participated in a Supports/Surfaces at the Musée d’Art Moderne of Saint-Étienne, which must have brought him some sort of closure of that stormy but fertile period of his life. Until 2010, Claude has been experimenting with painting on curtains, umbrellas, and sails. 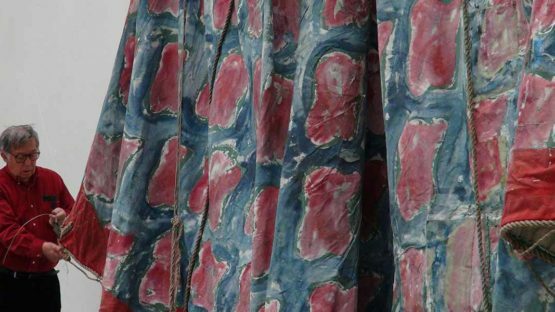 But, that year, Claude Viallat actually let himself into few collaborations directly with the world of fashion! He designed a small collection of boots for the prestigious brand Sergio Rossi, presented at that year’s Milan Fashion Week. And, he didn’t stop there. Next in line was synergy with Hermès, established in 1837. 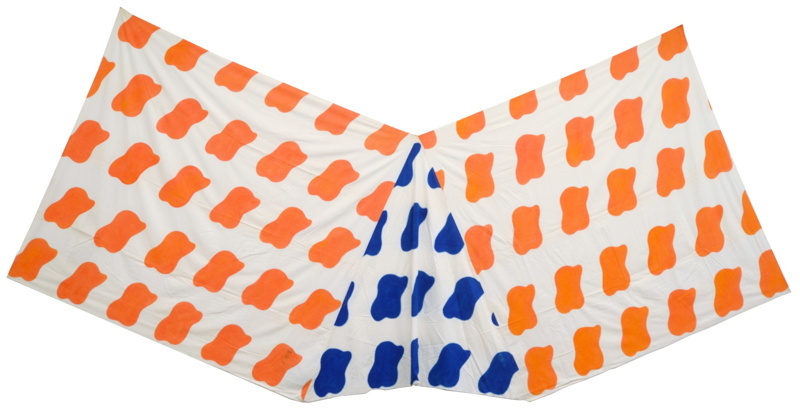 Especially for this brand, Viallat created a series of designs for their trademark silk scarfs, woven by the house of Hermès. As an inspiration, Claude chose to reference the infinite possibilities of colored forms systems and quasi-living, organic forms like the amoeba, for example. Claude Viallat was honored with the Fine Arts Academy’s Fondation Simone et Cino del Duca award in 2006, and his 2014 retrospective at the Musée Fabre in Montpellier once again reminded the artistic community of his achievements, presenting the extent of this work and a half of century-long career. This artist never stopped questioning traditional norms, canons and forms of art, being sometimes extremely radical but exactly that approach is what left us with a rich and always surprising oeuvre – a Claude Viallat’s endowment residing in many museum collections like those of Musée National d’Art Moderne, Fondation Cartier, CAPC Bordeaux, Museum of Modern Art, The Kunstmuseum Basel, and the Musée des Beaux-Arts de Montréal. This artist is represented by Galerie Brugier-Rigail from Paris. Claude Viallat lives and works in Nîmes, France.